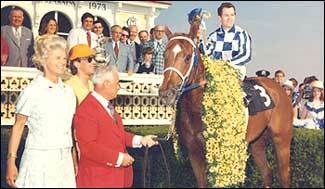 Forty years ago today Superhorse–Secretariat won the second leg of the Triple Crown-the Preakness Stakes at Pimlico in Baltimore, Maryland. Secretariat was the winner followed by Sham-who finished second also in the Kentucky Derby and then third was Our Native. Secretarist’s time 1:53 is still the record. below is a link to the video of the 1973 Preakness Stakes.